I liked the composition of this particular panel. Two of the well-established vendors that dominate the market matched with two upstarts looking to innovate their way to the top. It made for a livelier discussion. 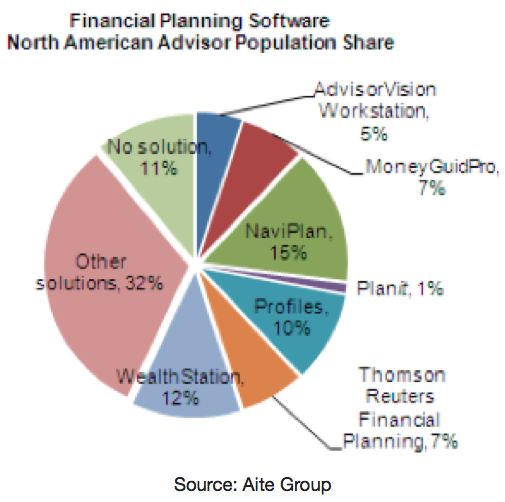 What is your firm’s approach to financial planning? One of the goals of inStream Solutions is to amplify the ambitions of how software can help a wealth management firm, Murguia announced. It’s difficult for advisors to justify their fees when they are always in a reactive mode, he claimed, so the inStream software can proactively guide clients through their life cycle to help them to make the right decisions in everything that intersects finance. The investment-centric approach is dying on the vine, Murguia proclaimed, since building model portfolios has become a commoditized business. Advisors who insist on staying investment-centric will probably succumb to LearnVest or someone similar, he said. The advice industry has to compete against retirement calculators and other free tools since advisors are using them on the side anyway. Planning software should not only identify opportunities but also help coordinate them to keep advisors from having to go to a third party system, he said. The folks at Zywave believe that there is both an art and science to financial planning, Strachan asserted. They provide the science and the advisor provides the art. Their software avoids complex optimization strategies in order to emphasize the advisor’s skills and their value added to the process, she stressed. Tishkevich believes that the future of advice is in mobile since it can deliver effective engagement and improves client communication. His firm released a mobile app called RetireLogix, which is available for both iOS and Android. The app can be branded to become a sort of personal digital business card, he noted.